The only meeting in December is our annual Holiday Party. We had a lovely time this year! Thanks so much to everyone who cooked, baked, and shopped for tasty specialties and drinks! 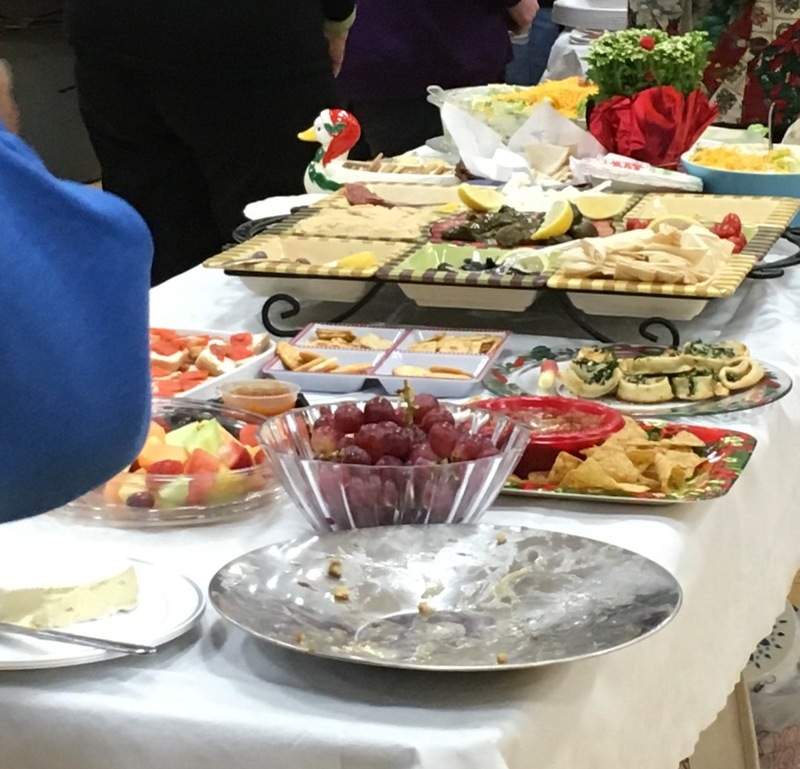 It was a lovely spread. So many delicious options to choose from! Charlotte emceed the Yankee Swap. The presents presents were all great...so there was very little swapping! Several collections of black and white FQs, a handmade blue bag and a giraffe print bag filled with supplies did make several circuits around the room. A handful of other items were swapped as well. All the exchanges were done in very good spirit! Thanks to Mary Duffy, owner of Halls of Tara Florists on Centre St in West Roxbury, for supplying the plant decorations! 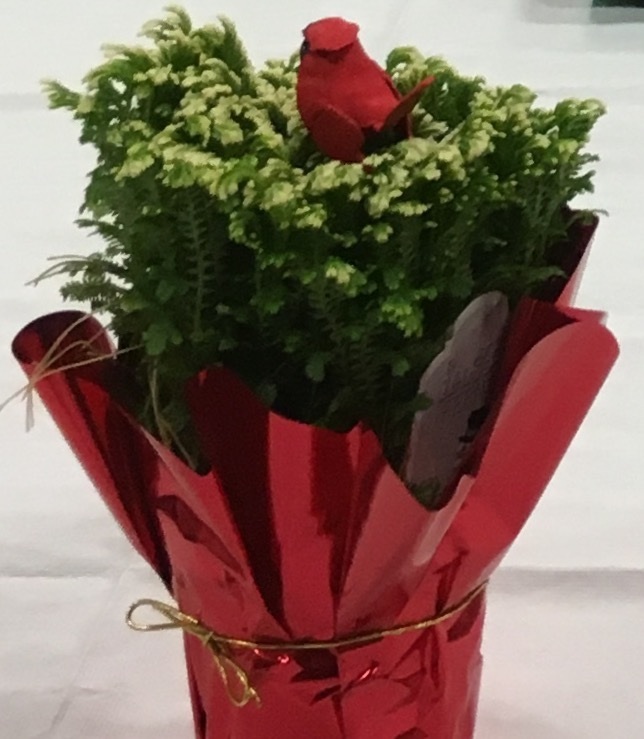 The Frosty Ferns on the tables really looked snow capped and the cardinals on the top of each plant were really cute! Looking forward into next year, Kace has asked for Toddler size Comfort Quilts for the daycare for homeless children we support. The quilts should be 40-50 inches wide x 50-60 inches long. Kace brought bundles of fabric collections for folks who need them to the December meeting. She'll bring them again in January. She also has some fabric for backings and a whole roll of batting. Just let her know the length of batting you need for the quilt(s) you are sewing. PBQ is hoping to supply 50 Toddler Quilts for the daycare. Kace and Judy K. report 10 have already been donated!! January is a great time to snuggle into a warm sewing space and do some quilting! The planned donation date is March 10, 2016. We have a meeting on March 9 so please plan to bring quilts by then. Sooner is good too! Thanks!!! It will be fun to see the all the Toddler Quilts the guild makes!! Happy Holidays and Happy Quilting in 2016! !